Liquid metal battery technology with rockstar VC investors and MIT prof founder. What could go wrong? We caught up with grid-scale energy storage company Ambri's CEO, Phil Giudice, a few minutes before he was to cut the ribbon for a new battery factory. Massachusetts Governor Deval Patrick was at the event as well. Ambri is still building demonstration units and prototypes. Its new factory will eventually be able to produce 138 megawatt-hours of annual battery capacity -- but for now, its prototype stands at 35 kilowatt-hours and 8.75-kilowatt peak capacity. The grid-scale energy storage units will be sized at 2 megawatt-hours, with "substantial" production in 2016, according to the CEO. Giudice noted that the company's pilot project in Hawaii will be installed next year in partnership with First Wind, with funding from the DOE- and ONR-sponsored Hawaii Energy Excelerator. “Consumers in Hawaii are plagued by high electricity prices because their generation system is based primarily on diesel fuel. Wind and solar resources paired with energy storage can completely replace the diesel infrastructure, resulting in lower electricity prices and a more reliable electricity grid,” said the CEO in a release. Ambri raised a $15 million Round B from Khosla Ventures, Bill Gates and energy company Total in 2012. The inventor of the core technology for the battery is Don Sadoway, MIT Professor of materials chemistry. Sadoway has challenged the research community to invent a colossal yet cheap battery. He directed researchers to look at the economy of scale of modern electrometallurgy and the aluminum smelter, which handles the holy grail of batteries: achieving a high current while maintaining massive scale. Sadoway used magnesium to "intimidate" antimony into behaving like a non-metal. From there, using seed money from within MIT, Sadoway and his team invented the liquid metal battery, or, in the parlance of the academy, a process called Reversible Ambipolar Electrolysis. The battery uses molten antimony and molten magnesium separated by an electrolyte. In an earlier lecture, Sadoway observed that lithium-ion batteries in cell phones "need to be idiot-proof, largely because they are in the hands of idiots," and that batteries in cars need to be able to withstand a crash. Stationary batteries for bulk storage are not held to those same requirements, which allows more freedom in terms of the choice of chemistry. However, the application requires a very low price point -- and Sadoway insists that you have to think about price point at the beginning of the product design process. It's no secret that Ambri investor Vinod Khosla is not a big fan of lithium-ion batteries. Khosla has funded a number of other energy storage companies including Pellion, LightSail, QuantumScape, and Seeo. Aquion, funded by KPCB, ATV and Foundation Capital, is developing a saltwater electrolyte-based system. Eos has a zinc-air battery with some customer traction. Stanford University technology can be found in Huggins Group battery startup Alveo Energy. There are dozens more startups aiming for utility-scale energy storage working with compressed air, mechanical systems, flow batteries, and other electrochemical means. GTM Research just published a report entitled Grid-Scale Energy Storage in North America 2013 that profiles many of these firms. Keep in mind that while these startups struggle for their first megawatt of energy storage production, AES has already installed 100 megawatts of energy storage, and enormous incumbents such as S&C, ABB and GE are focusing on this problem as well. 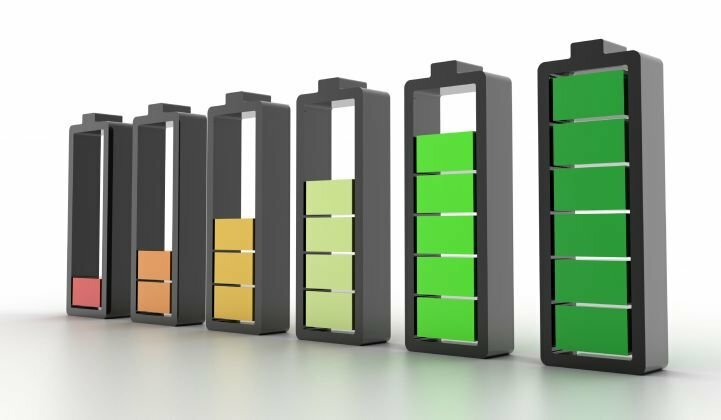 The price of storage technology is falling as utilities and industrial and commercial consumers begin to understand the value of energy storage. The regulatory situation at a state level (California's recent energy storage mandate) and at the federal level (FERC 755) has never been this positive and forward-looking. Ambri CEO Giudice spoke to GTM of "24-hour power from renewables," with Hawaii no longer needing to curtail wind because of energy storage on the grid. "They can back down on diesel instead," said the CEO.